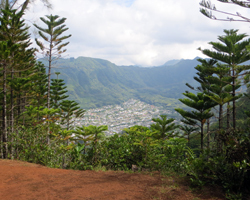 Waahila Ridge: A Peaceful Scenic Park or a Grueling Mountaintop Hike. Peaceful Scenic Respite or Grueling Mountaintop Hike! Ever since I discovered Waahila Ridge State Park back during my college days, this mountaintop recreation area has been one of my favorite peaceful places in all of Oahu (and certainly one of my favorite things to do in Honolulu). From my perspective, I can get world-class beach resorts any day of my life. But what I can’t often get is a mountaintop pine forest. Needless to say, if you live near any major mountain range, you might be just the opposite. So if that’s the case, let me re-direct you back to reading about Hawaii beaches. What I mean is this: Waahila Ridge, the park, is as fresh, tranquil, and scenic as any Hawaii activity gets. 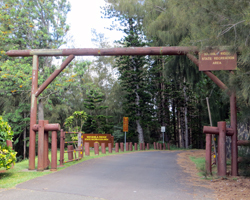 But the hiking trail that starts in this park and then climbs to the 2,300-foot summit of Mount Olympus… well, that’s one of the longest and hardest Hawaii hikes that I’ve done (not counting the ones that have no name or actual trail). So, which of these reasons best suits you…? 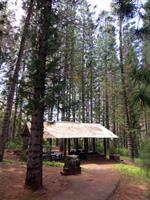 Set amidst a towering forest of Cook Island Pines at the top of the Saint Louis Heights neighborhood (between Manoa and Palolo valleys), Waahila Ridge State Park is a shady, breezy, quiet and scenic piece of paradise! Back when I lived in town, I went there regularly just to read and relax. There are lots of tables and benches for picnicking. There are three fairly-well maintained pavilions (with grills) for partying. And if all you want to do is let your kids run wild for a while, you can turn them loose without fearing any of the usual hazards you’d expect elsewhere: poison ivy/oak, bears, cougars, snakes, etc. None of those here. If you’re feeling brave, you could climb out onto the "air chair" for some unobstructed photos. If your interest is Hawaii sightseeing and checking out the view, this Hawaii scenic spot delivers. 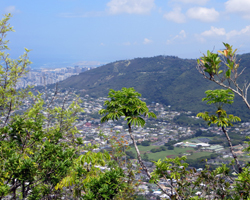 Just walk up to the edge of the cliff and see all of Manoa Valley and west Honolulu laid out one thousand-feet below you. The valley is always green and lush, and the mountains make a visually striking backdrop! 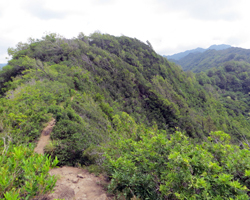 The Waahila Ridge Trail is basically two trails: official and unofficial; and it’s connected to the much longer Na Ala Hele Trail system. 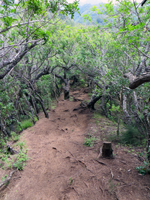 The official trail is approximately five miles long (round-trip) and ends near the back of Manoa and Palolo Valleys. The trail to the end is your typical Hawaii ridge hike: lots of steep ups and downs with some narrow spines of land in between. The total elevation gain is approximately 500 feet; and depending on your level of physical fitness, this will take you approximately three hours (give or take). Climbing up to the right of the trail-end sign, you’ll see that the path continues along a less-maintained line up to the top of Mount Olympus Oahu. This unofficial trail climbs approximately 800 feet in about a half of a mile (one way). It’s narrow, steep, and slippery. 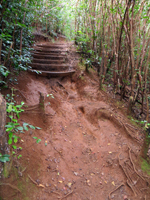 This is where the trail gets much more difficult and much more dangerous – especially if it’s wet (which it frequently is, since this area of Oahu is classified as a tropical rainforest). Furthermore, your chances of summiting in the clouds are much higher than the possibility of reaching the top on a crystal-clear, maximum visibility kind of day. Full Disclosure: Although I’ve hiked to the official end of the Waahila Ridge Trail four or five times, I haven’t had the time (or physical stamina) to climb all the way to the summit since about a week before I graduated college. Hiking the full-length of the ridge and summit trails takes approximately five hours and leaves you exhausted for the rest of the day. I tried digging through my old pre-digital photographs to find some from the summit but couldn’t find any. Quite frankly, I can’t even remember if I brought a camera with me. So the pictures shown here are recent, but they are all within the first half-mile or so along the trail (just to give you a visual sense of what to expect).